"All night I have been thinking out the details of my Uniform Edition ..."
A uniform edition is a collected edition of an author's works which are bound in identical bindings of uniform size, shape and color meant to be displayed prominently in a home. They are a visual statement that an author has reached the upper limits of a stellar career. Uniform editions also promise additional royalties for an author. For the book buyer, owning a uniform edition of an author's works signifies both good taste and a lifestyle that values a home decorated with well-stocked bookshelves. For the book buyer of the Victorian era, this often meant sets of books bound in red leather with elaborate gold stamping on the spines and gilt-edged pages. Such uniform editions appealed to the psychological desire for wholeness and completeness among both buyers and authors. Ernest Hemingway, in Green Hills of Africa, wrote, "All modern American literature comes from one book by Mark Twain called Huckleberry Finn. American writing comes from that. There is nothing before. There has been nothing as good since." 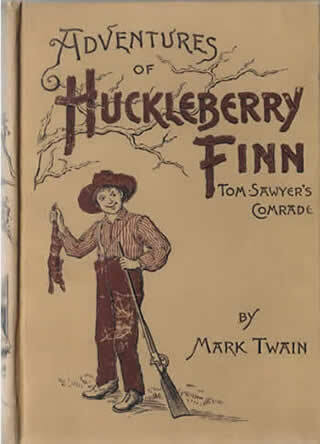 Clemens was about fifty years old when Huckleberry Finn was published and very few American authors had written enough books to justify the production of a uniform edition of their work. Uniform editions found in most American homes by the middle of the 19th century were those of British or European authors such as Sir Walter Scott or Charles Dickens. In 1873, Sam Clemens and his wife Livy purchased a set of Scott's novels and Clemens proudly wrote to his mother-in-law, "Our books have come -- a rare thing we have been on the track of for ten days -- got it at last -- the famous Abbotsford Edition of Scotts works -- 12 huge volumes elaborately illustrated" (Samuel Clemens to Olivia Langdon, 2 and 6 August 1873). We can hardly be too much obliged to Houghton, Mifflin and Co. for giving us a complete and uniform edition of the works of Bret Harte. This was just what the public wanted, and it was certainly not more than the best short story writer that the English speaking portion of the world has yet produced deserved ("Boston Correspondence," Hartford Daily Courant, 25 February 1882, p. 1). Clemens probably read the item and likely felt a twinge of envy. Throughout the 1880s and into the 1890s the number of American writers who were getting uniform editions continued to grow. Houghton, Mifflin and Company produced uniform editions of John Greenleaf Whittier, Oliver Wendell Holmes, James Russell Lowell, Nathaniel Hawthorne, and Henry Wadsworth Longfellow. Between 1894 and 1896 a collected edition of the works of Edgar Allan Poe was issued by Stone and Kimball of Chicago. Mark Twain's first major work The Innocents Abroad was published in 1869 by American Publishing Company of Hartford, Connecticut. The company was a relatively new business, founded in 1865 and specializing in subscription book publishing. Subscription books were sold by door-to-door salespersons who took advance orders, mostly from residents in rural areas of the country. American Publishing Company was headed by Elisha Bliss and his sons Frank and Walter. Under the Bliss management, the company published other Mark Twain titles including Roughing It (1872); The Gilded Age (1873), a novel written in conjunction with Twain's neighbor Charles Dudley Warner; Sketches New and Old (1875), a collection of Mark Twain's early newspaper and magazine contributions; The Adventures of Tom Sawyer (1875); and A Tramp Abroad (1880). Twain's first editions were elaborately and profusely illustrated. Buyers could choose from a variety of bindings with gilt stamping, all of which were intended to provide visual appeal. 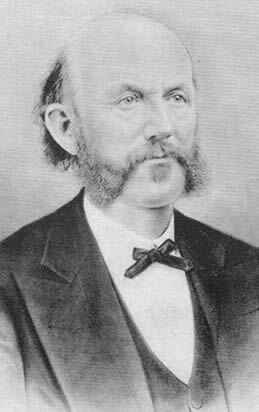 Clemens eventually became a director and partner in American Publishing Company but grew increasingly distrustful of Elisha Bliss and his bookkeeping shenanigans. After publication of A Tramp Abroad with American Publishing Company, Clemens switched publishers and teamed up with James Ripley Osgood who had published Bret Harte's first book. Osgood was affiliated with Atlantic Monthly, the magazine that had published Mark Twain's "A True Story" in 1874. Osgood later issued it as the title story in a small book titled A True Story and The Recent Carnival of Crime (1877). Osgood published Mark Twain's The Prince and the Pauper in 1881 and The Stolen White Elephant in 1882 -- the same year Houghton, Mifflin and Company released Bret Harte's uniform edition. In early 1882 Osgood and Clemens returned to the Mississippi River valley to gather stories and ideas for his next book, Life on the Mississippi. 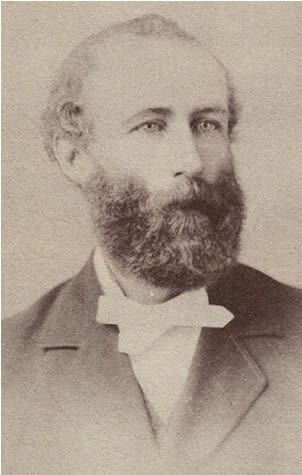 In late October 1882 Osgood brought Clemens's nephew by marriage Charles L. Webster into his company to help manage a subscription book department. Osgood published Life on the Mississippi in May 1883. Sales of Life on the Mississippi were disappointing and Clemens decided to drop Osgood as his publisher and start his own publishing firm called Charles L. Webster and Company in 1884. Osgood's firm went bankrupt in 1885 and he found work with Harper and Brothers as their agent in London. When Clemens started his own publishing house in May 1884, he hired his nephew Charles Webster to manage it and gave the company Webster's name. 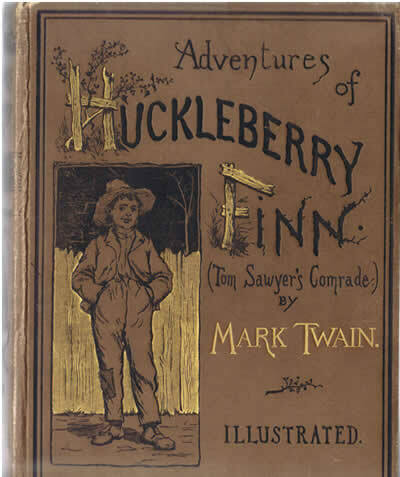 The first book issued by Webster and Company was Mark Twain's Adventures of Huckleberry Finn in 1885. 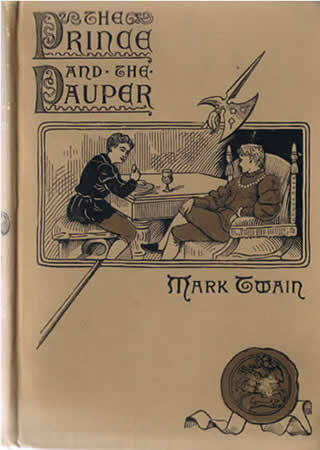 In 1889 Webster and Company published their second Mark Twain book -- A Connecticut Yankee in King Arthur's Court. In addition to his own works, the company published works of other authors, including the memoirs of Ulysses Grant, one of the company's most successful endeavors. 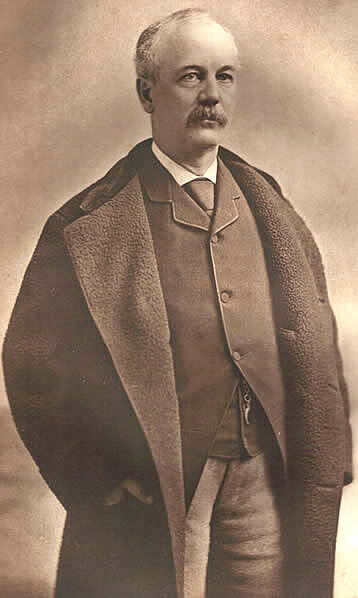 When Clemens's former publisher James R. Osgood went bankrupt in 1885, Webster and Company took over the rights to the Mark Twain titles that had been published by Osgood. Webster reissued editions of The Prince and the Pauper (1885, 1887, 1889, and 1891), The Stolen White Elephant (1888), and Life on the Mississippi (1888 and 1891). (For a complete listing of other Webster and Company's titles, see "Mark Twain, Publisher"). Between 1887 and 1890 Webster and Company embarked on a project to sell by subscription a uniform edition of A Library of American Literature: From the Earliest Settlement to the Present Time, an elaborate eleven-volume edition of various American authors. The volumes were edited by Edmund Clarence Stedman and Ellen MacKay Hutchinson. Stedman was a journalist, poet and member of the New York Stock Exchange. Hutchinson, who later married art critic Royal Cortissoz, was on the editorial staff of the New York Tribune. The eleven-volume set included leather bindings, marbled end boards, and tissue guards for steel engravings. Every noted American author was represented. Mark Twain's contributions were included in Volume 9 and consisted of three selections -- "The Notorious Jumping Frog of Calaveras County," a passage from The Prince and the Pauper, and a passage from Adventures of Huckleberry Finn. Stedman, the poet, made a compilation, several years earlier, called The Library of American Literature -- nine or ten octavo volumes. A publisher in Cincinnati had tried to make it succeed. It swallowed up that publisher, family and all. If Stedman had offered me the book I should have said "Sold by subscription and on the installment plan, there is nothing in this book for us at a royalty above four per cent, but in fact it would swamp us at any kind of royalty, because such a book would require a cash capital of several hundred thousand dollars, and we haven't a hundred thousand." But Stedman didn't bring the book to me. He took it to Webster. Webster was delighted and flattered. He accepted the book on an eight per cent royalty, and thereby secured the lingereing suicide of Charles L. Webster and Company. The slow cash flow from subscription books sales, especially the expensive-to-produce uniform edition of Library of American Literature, combined with Clemens's other unsuccessful investments, forced Clemens to find ways to reduce his family's living expenses. In the summer of 1891 he closed his mansion in Hartford and moved to Europe. Clemens became a trans-Atlantic commuter to handle his publishing business. The idea of issuing his own collected works in a uniform edition continually appealed to Clemens as a means of increasing his royalties. According to Mark Twain scholar Louis Budd, Clemens "wanted the psychological reassurance and the visible, substantial badge of a collected edition" (Budd, p. 93). An 1891 Holiday Edition in light brown cloth was the first attempt by Clemens to publish three of his own works in a uniform edition sold as a set. Photo courtesy of Kevin Mac Donnell. Other advertising priced the three-book set at $6.00, complete in a box or individually priced from $2.75 - $3.00 each. The books were square octavo and uniform in style. According to rare book collector Kevin Mac Donnell, the Holiday Edition of 1891 was printed from the plates of the first editions with no changes to texts other than the title-page date. All were bound in light brown cloth with new spine designs, but the cover designs were stamped from the same brasses as the first edition bindings. According to Mac Donnell, "So far as I can determine, all three were the last editions printed from the first edition plates for these three titles." In 1891 Webster also released smaller, inexpensive editions of Adventures of Huckleberry Finn and The Prince and the Pauper in matching bindings. Known in the book trade today as the "cheap" editions, these editions sold for $1 and were bound in matching light tan bindings to appeal to buyers on a more limited budget who also wanted uniformity. These editions were from new printing plates and used fewer illustrations than previous editions. These volumes were "12mo" (duodecimo). Photos of "cheap" editions first issued in 1891 by Webster and Company courtesy of Kevin Mac Donnell. For a complete comparison of the illustrations that were selected for use in the 1891 edition of Huckleberry Finn, see "1891 Huck Finn Illustrations" online from the University of Virginia. 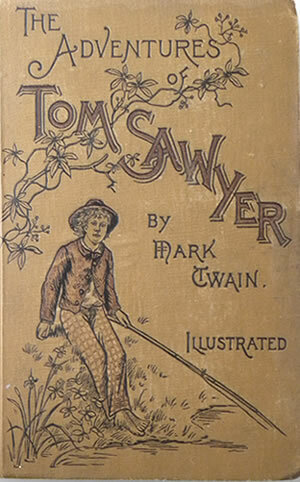 Webster's marketing attempts with the cheap editions of titles from his own stock were matched in kind by the American Publishing Company who retained the rights to The Adventures of Tom Sawyer and Sketches New and Old. The 1892 and 1893 editions of these two books from American Publishing Company and Watson Gill also featured tan bindings. 1893 edition issued by Watson Gill and American Publishing Company utilized new printing plates, reduced the number of stories from 63 to 48 and eliminated many of the original illustrations. Watson Gill (b. 1837- d. 1903) of Syracuse, New York was a prominent bookseller and affiliate of American Publishing Company. In his latter years he worked in the wholesale book trade and according to his obituary had amassed a considerable fortune at the time of his death. Gill later obtained from Webster and Co. the exclusive rights to publish Mark Twain's Life on the Mississippi. Clemens described Gill as "an excellent man to handle books, and is prompt pay..." (Clemens letter to Henry H. Rogers, 9 December 1894.) It is likely that Gill's attempts to match the style and bindings of Webster's inexpensive additions were met with favor by Clemens. Webster did not attempt further efforts to make Mark Twain's works look "uniform." 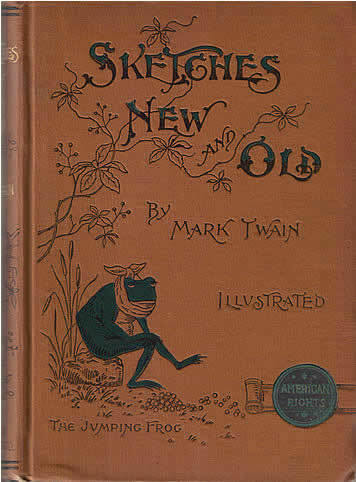 The company issued Mark Twain's Merry Tales and The American Claimant in 1892 in their own separate and unique bindings. These two books were followed by The £1,000,000 Bank-Note and Other New Stories (1893) and Tom Sawyer Abroad (issued on 18 April 1894, the same day Webster and Company filed for bankruptcy). Faced with a monumental task of pulling himself up from financial failure, Clemens who was living abroad continued to write and returned once again to Frank Bliss and the American Publishing Company for the release of his next book, The Tragedy of Pudd'nhead Wilson, in November 1894. Clemens felt the publication of a complete uniform edition of his works would translate into additional royalties, money he badly needed. But his copyrights were scattered. What he needed was a sound financial advisor and contract negotiator. Enter Henry Huttleston Rogers. Budd, Louis J. "Mark Twain's Books Do Furnish a Room: But a Uniform Edition Does Still Better," Nineteenth Century Prose, Vol. 25, No. 2, Fall 1998, pp. 91-102. LeMaster, J. R. and James D. Wilson, eds. The Mark Twain Encyclopedia. (Garland Publishing Inc., 1993). Mac Donnell, Kevin. Personal correspondence, September 2009. Mark Twain Project online database of letters from the Mark Twain Papers/Project at the University of California at Berkeley. Twain, Mark. Adventures of Huckleberry Finn. The Works of Mark Twain edition. Victor Fischer and Lin Salamo, eds. (University of California Press, 2003). _____. Mark Twain in Eruption. Edited and with an introduction by Bernard DeVoto. (Harper and Brothers, 1940). Waters, Henry Fitz-Gilbert. The New England Historical and Genealogical Register, Vol. 58. (New England Historic Genealogical Society, 1904). Online from google books - (contains memoir of Watson Gill by Ezekiel W. Mundy, pp. cviii - cix).